Dinner in a 17th century Italian villa where Lord Byron courted the Countess Giuccioli and wrote some of his best poetry; impromptu concerts, and speed boat rides are just some of the many surprises that our charismatic Cruise Director, Graziella, had organised for us on our European Waterways luxury barge cruise of Northern Italy. From the moment we boarded La Bella Vita, moored in Venice, for the start of a six-night cruise, we were embraced by the Italian crew who served, entertained and looked after us in the most delightful way. With a glass of welcoming prosecco in hand we met our fellow passengers, from the USA and Australia. There were eight of us in total, although the barge can accommodate up to twenty. Space is limited on a barge but the cabins were adequate and extremely comfortable. There is a resident chef, and the food was excellent and plentiful, so much so that by the end of the cruise it was becoming a challenge to get zips up. Lunch and dinner were always a three-course journey through Italian cuisine, complimented perfectly by a choice of Italian fine wines which were colourfully described by our lovely hostess, Francesca. The crew generally spoke good English though we did love some of their ‘interpretations’. The advantage of cruising on a barge, rather than an ocean or river cruise ship, is that you dock in small villages and towns, allowing an authentic glimpse of local life. We particularly loved the opportunity to cycle. The barge keeps a number of bikes on board for guest use, and they give you the freedom to explore the villages and surrounding countryside. Our itinerary included guided tours. Being a small group was perfect – no flag waving or microphones necessary. After settling into our cabins there was time for a stroll in St Mark’s Square, near our mooring, and a private tour of the famous Doge’s Palace, before returning for dinner on board. Seated round one long table is the perfect opportunity to get to know fellow passengers and, with wine flowing like the river, we all got along wonderfully. 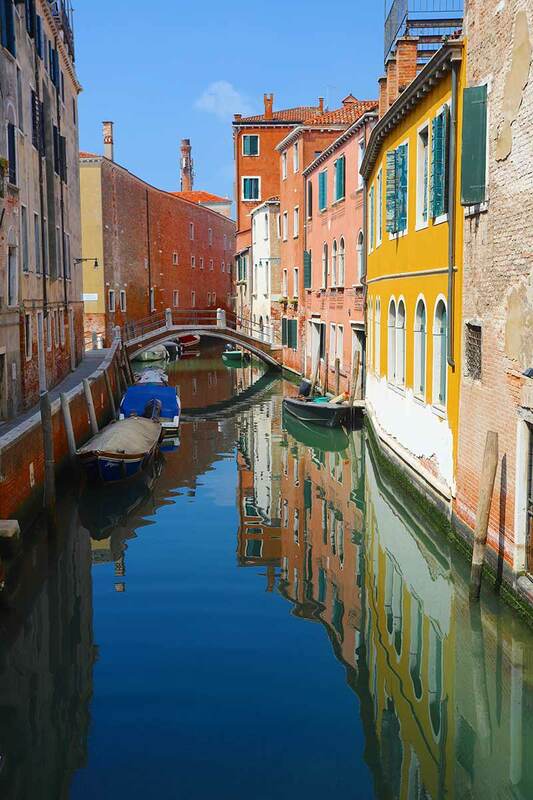 The next day, Graziella had organised a speed-boat to take us the short journey along the canal to Murano Island, famous worldwide for its Venetian glassware. We visited the glassmaking factory where we were given a demonstration by the craftsmen as they heated the glass to melting point and then fashioned it into ornaments and vases with astonishing skill. The island, not surprisingly, was full of glassware shops. I was tempted, but, ever the voice of reason, my other half pointed out that the brightly coloured glass horse I so admired, really wouldn’t work in our Yorkshire house! Returning to the barge for lunch, we departed for an afternoon cruise along the Pellestrina which separates the Venetian Lagoon from the Adriatic Sea. Docking in the small fishing village of San Piero in Volta, we enjoyed a cycle around the small, colourful town, stopping at a local bar on the way for a gelato. The next day, after breakfast, we cruised along the River Po, to dock in Chioggia, known as little Venice because of its similar canals, bridges, and calli (little streets). Historically, fishing has provided the livelihood of the port, and it is still the main source of its economy. We were taken on a short cruise around the city and harbour, on a traditional, locally- built boat. The guide gave us an insight into Chioggia’s fascinating history and everyday life. Afterwards, we had time to wander through the bustling fish market, visit the impressive cathedral, and do a little souvenir shopping, before returning to the ship for dinner. Legend has it that the Italian greeting ‘Ciào’ originated in Chiogga, where, in Venetian dialect the phrase, ‘s-ciào vostro’ meant ‘I am your slave’, over time it was abbreviated to ciào. A morning cruise gave us chance for some relaxing on-deck chill out time, before arriving at our next stop, Ro Ferrarese. There, we were met by the barge’s minibus and driven to the Dominio di Bagnoli Vineyard, for a private wine-tasting of their renowned vintages. We were escorted around the estate with its exquisite gardens and vineyards, where the speciality Friularo grapes, used in the production of prosecco, are grown. Finally, we visited the wine cellars, where we enjoyed a tasting of a range of fine wines – a thoroughly enjoyable afternoon. Back on board, and sobering up enough to have dinner, and more wine, we were to experience another of Graziella’s little surprises. Candles suddenly appeared on our table, lights were dimmed, and seemingly out of nowhere, came the most wonderful operatic voice – our own in-house concert was about to begin. With a male tenor and female soprano, accompanied by a pianist, we were royally entertained with some classical and modern interpretations from famous operas – a delightful end to a perfect day. The cruise continued along the River Po to the Renaissance city of Ferrara. We had a morning guided tour of the city and the Schifanoia Palace, renowned for its fabulous art and 15th century frescoes. Afterwards, we had plenty of time to wander around the old city streets and enjoy the ambiance, stopping for a cappuccino, and, of course, some shopping. The many chic boutiques, stocked with beautiful Italian clothes, were irresistible and we really loved this city, oozing with authentic Italian character. All too soon it was the last day of the cruise and La Bella Vita left the River Po to sail gently across Mantua Lake, mooring alongside the city’s spectacular ancient walls. Famous for its extraordinary neo-classical and baroque architecture, and its role in the history of opera, Mantua became the Italian Capital of Culture in 2017. The Old Town was declared a UNESCO world heritage site in 2007. After docking we set off on bikes to explore the outer city area, following the cycle path by the side of the lake. This was the most scenic route and the best way to take in the dramatic views of this beautiful city. In the afternoon we visited the magnificent 14th century Ducal Palace with its extraordinary art, sculptures, and gardens. Mantua was the setting that inspired Giuseppe Verdi’s acclaimed opera ‘Rigoletto’. A sculpture of the famous jester stands outside what was reputedly his house and is now a museum and tourist information centre. iOur last night on board began with cocktails on deck, before our captain, Roger, hosted our final dinner. This type of cruise is very informal and dress code is relaxed but we all made an effort for the captain’s dinner and, as we posed for some ‘must do’ group photos, we reflected on what a great cruise this had been. The places we visited, off the normal tourist map, our new friends, delicious meals with ridiculous amounts of wine together with our great crew, had made the journey wonderfully memorable and lots of fun. For those who hate the idea of big ship cruising, and want a more relaxed and interesting experience, I can really recommend you try a barge cruise. If you’re celebrating a special event or want a big family holiday get together, you can book out the entire barge, together with the chef and crew – sounds like a great plan to me.